Works from the “Golden Age of Russian Ballet and Theatre Design” exhibition are on show at London’s St. Petersburg Gallery through July 28th. The two-room exhibition features set designs, costumes and paintings inspired by ballets from Prokofiev and Stravinsky, among others. Stepping out of the London drizzle into the St. Petersburg Gallery is like walking into a folk tale. The Mayfair exhibition space glows with scarlet birds of paradise and fantastical palaces. Here, visitors can see a shadowy forest or glimpse a white-sailed galleon behind a beach full of dancing corsairs; nearby, the yurts and smoking campfires of a twilit battlefield evoke the legendary campaigns of Prince Igor. The green skies and crescent moon are the characteristically symbol-laden work of Nikolai Roerich, whose imaginative costumes for “The Snow Maiden” are on show downstairs. The influence of Sergei Diaghilev’s Ballet Russes dance company informs many of the pieces here. This famous group, which danced around Europe in the first decades of the 20th century, inspired artists to match new music and choreography with innovative designs. Leon Bakst’s designs for Rimsky-Korsakov’s “Scheherazade” illustrate a love of exotic colors and Eastern forms, while Natalia Goncharova’s sets and costumes for the opera “The Golden Cockerel” display her bright, avant-garde style. Her stage design for Carlo Goldoni’s “The Fan” (an evocative Italian street scene) contrasts with the bold colors and almost-abstract forms of her costume design for a Spanish dancer with a fringed, flowered shawl. Any commercial gallery would be excited about displaying Goncharova’s work these days. She has twice set new auction house records for the top price commanded by a female artist, breaking through to the $10-million mark in February 2010. The combination of fine art and collectability brought around 350 people to the exhibition’s launch party on April 18th. All the pieces on show are for sale (if you happen to have a spare half-million or so) and come from various private collections. Entrance to the gallery is free. The two-room exhibition lacks the curatorial structure and focus of a museum display. There is currently no public catalogue and little in the way of background information. The thematic link is tenuous in places, encompassing Ilya Repin’s inky sketch of “A Theatre Exit,” as well as decorated plates and porcelain figurines of dancers. Downstairs, there are works that have nothing to do with the theme; but when these include a misty painting of “Barges on the Seine” by Robert Falk, or two of Ivan Bilibin’s magical illustrations from 1900, visitors are unlikely to wish them away. Larionov’s pen-and-ink portrait of Diaghelev and deconstructed oil painting of Igor Stravinsky hang nearby: A jumble of half-finished lines surrounds the composer’s sad face and disembodied pipe. 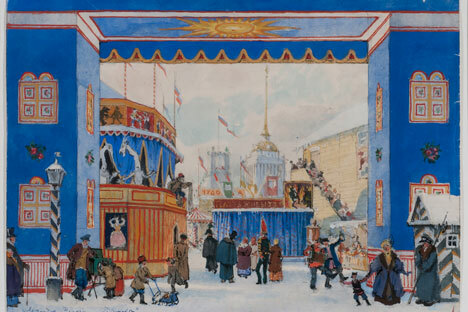 There are several designs from Alexander Benois’ 1930 version of “Petrushka” – Stravinsky’s ballet about a puppet who comes to life. There is also a drawing of a stage set for a play based on Dostoevsky’s novel, “The Idiot” – an echoing drawing room with a tiled stove and grand piano. In contrast, a scene from “Petrushka” shows monsters flying on pitchforks over the battlements through a sky full of comets. Leaving the gallery, it is almost surprising not to find exotic dancers whirling through the Burlington Arcade or onion domes sprouting from the roof of the Royal Academy.